August | 2010 | Agile KM for me… and you? Twitter survey results: who tweets most (about work)? The best evidence you can get is the one you go get yourself. Well, in theory anyway… But it certainly helps to get to first hand data. How many times per day do you tweet (on average)? 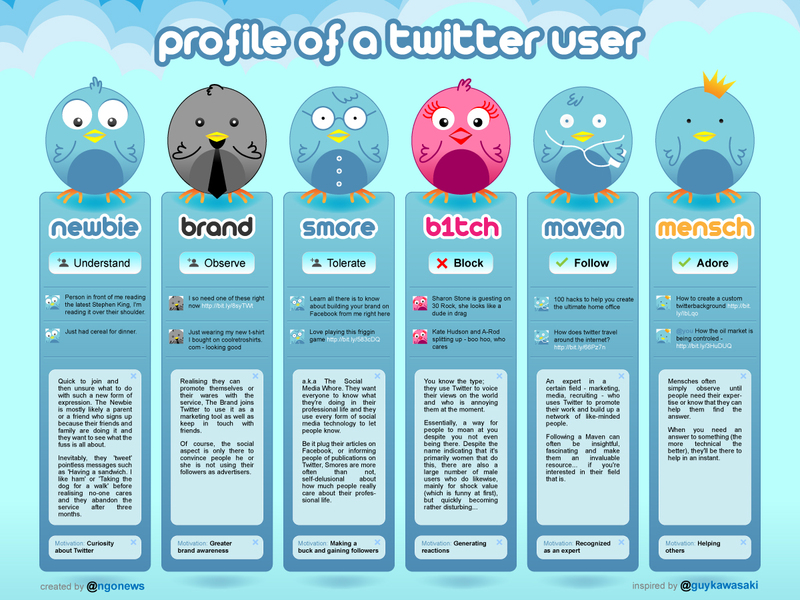 What proportion of your tweets is for professional vs. personal purposes? Are you working as an employee, as an independent worker or else? And I left a blank space for any additional comment or question. 19 respondents took part: 10 employees, 8 independents, 1 student – a very small sample I agree but it’s a try-out after all! From the sample, what can we say about twittering volume? Respondent employees generally tweet 2 to 15 times per day (four do it 2 to 5 times, another four 6 to 15 times) while independents are rather very minimal tweeters (four of them twittering once per day or less) or abundant tweeters (three twittering 6 to 15 times and one over 26 times per day). In other words, employees are spread around the average, while independents are located on the extremes of twittering a lot – or not. An overwhelming majority of employees actually tweet about their work: 7 out of 10 of them tweet overwhelmingly about work (75% or more, and 90% of them tweet about work more than about personal life). This is to be expected if one considers that social media by and large still have to convince at the work place and that using Twitter to send news about cooking recipes, holiday destinations or mood swings may not be seen as ‘appropriate behaviour’ (no judgment intended on my side here, I love good recipes and nice holiday tips). In contrast, independents span the full spectrum of professional vs. personal twittering with two of them for each of the segments (except 100% personal or 100% professional), so there isn’t much of a pattern among respondents from my sample. 7 respondents left some comments and I just copy most here as they add some depth to the survey: Twitter is my most current and richest source of information… My boss loves Twitter, so I started using it as per his request… I’m one of the older Tweeps at work. Suspect age has something to do with it as well… Reading my tweets and tweeting is the best part of my day!… I think my use of twitter really depends on how much time I have per day. Some days I am humming away while on others, more busy one, I don’t… IMO you need to engage in the personal to get the best out of the professional. There’s quite a bit of detail to delve into here. The boundaries I set for the amount of tweets is arbitrary and may not be right – giving confusing ideas about the patterns that come out. Anyone has better measures for these? Well, these are quite meagre results you might say, but this calls perhaps for a follow-up study, as there seems to be surprisingly little about recent twitter user demographics (Google query results) Anyone up for it?